Cinders and Sapphires by Leila Rasheed. Disney-Hyperion, 2013. Currently Available. Face Value: This cover is unsurprising. It doesn’t do much for me, as a reader, but it also doesn’t turn me off. It tells me that the book is going to be 1) historical, and 2) melodramatic. I wouldn’t expect it to be a conversation starter, but I wouldn’t feel the need to stick a book cover over it to read in public either. Does it Break the Slate? Only in a surface value kind of way. It’s not anti Slatebreaking. But one of the problems that’s bound to happen when you write stereotypical trope characters is that those characters don’t really get the chance to break out of their molds. The good characters are good and want and do good things. The bad characters are bad and want and do bad things. It makes for an entertaining read, but it’s not shattering any expectations or breaking any new ground. Who would we give it to? If you watch Downton Abbey or read The Luxe series, you are in the target audience for this book, and you will probably enjoy it well enough to give it 3 stars on goodreads. Review: As I said above, the characters in this book are flat, not particularly well-developed, and largely one-sided. I stand by that. But I also stand by the fact that I still really enjoyed reading this book. Maybe it’s just filling the Downton Abbey sized hole in my entertainment life? Or maybe it’s because at the end of the day I love historical fiction and this era enough that I’m more forgiving than I am with other things? Whatever it was, I had a great time reading it, despite its flaws. Here’s the story: The Averly family (including Lord Westlake and his daughters Ava and Georgiana) have returned to their Somerton estate from India for the first time in more than a decade. Because Lord Westlake has no sons (of course! ), his heir is a nephew, Sir William, who has run the estate into the ground with his reckless ways. So when Lord Westlake shows up with a new wife and three stepchildren in tow, there’s cause for surprise. Less surprising – there are scandals afoot! Ada dreams of Oxford and the handsome Ravi Sandreson, Georgiana is a tomboyish invalid who has her heart set on her new stepbrother Michael who only has eyes for the beautiful nursemaid Priya. (Go ahead and assume all characters are exceptionally beautiful, unless they are described as exceptionally plain”) The girls’ new stepmother, Fiona Templeton, is as shallow and vindictive as one expects a stepmother to be, and her daughter Charlotte follows in her arrogant and self-involved footsteps, trying to manipulate Ada at every turn. The oldest Templeton child, Sebastian, is gay, and rakish, and is trying to avoid being blackmailed by his former lover. Lord Westlake is kindly paternalistic and somewhat oblivious, and there’s some kind of scandal following him from India. Meanwhile, downstairs we are mainly focused on Rose, the daughter of the housekeeper who is promoted to be Ava and Georgiana’s ladies’ maid, who is kind and innocent and a very talented pianist, and Stella who is the Templeton’s ladies’ maid and is vicious and snobbish. With all these characters and a number of supporting characters filling out the spectrum of good and evil, there are deliciously enjoyable plot twists and personal dramas. It reads like an episode of a well-plotted soap opera. We see it coming and enjoy the gasps anyway. There are some ostensibly feminist narratives in this book, but it reads with an air of presentism, expecting our characters to hold similar values to our readers. Our “good” characters long for an education, our “bad” characters long for rich husbands. That said, I’m all in favor of characters like Ava, who are determined to pursue a dream of education regardless of her circumstance. That makes for a character I can identify with. Rose dreams of playing the piano and composing, but feels she isn’t allowed to have those dreams, given her station. Again, I’m all for talented protagonists who aspire beyond their circumstance, but there’s a layer of magic to Rose’s exceptional talent. Both of these major protagonists don’t show any signs of being “corruptible,” at least not from a modern standpoint. Their major flaws according to the characters in the book are things like ambition and social liberalism – things that we applaud as readers in 2013. So their characters are likable, and certainly the ones we identify with, but not always the most interesting. Accordingly, it’s the villains that I’m more curious about, in the long run. We don’t know anything about why stepsister Charlotte is as cold as she is, and only little about why her ladies maid Stella is a vindictive manipulator. I’m hoping that their characters get a little more play in future books in this series. 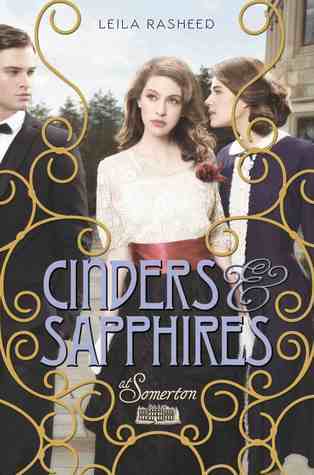 Anyway, as we’re approaching summer reading season (here anyway, it’s over 90 degrees in Arizona this weekend), I totally recommend Cinders and Sapphires as one to pull out by the pool. It’s a whole lot of fun. This entry was posted in Reviews, Young Adult and tagged Downton Abbey, Historical Fiction, Melodrama, Romance. Bookmark the permalink.